Most people think that the primary tone of a solid body instrument is just dependent on the electronics, the strings, and bridge. Nothing could be further from the truth. A solid body instrument is actually an acoustic instrument. Fine solid body guitars are made of fine tone wood. The acoustics are the limiting factor on sound. You can't simply replace electronics on a cheap instrument and expect great results. While the acoustic sound is low volume, the quality of that tone is the major factor on the sound. A great example are the Fender Instruments. The Fender Squire looks like a regular Fender, but it is made from plywood. Simply replacing the electronics won't make it the same as American Fender made with tone woods. Similarly, Gibson sells guitars made of good acoustic qualities, while under the brand name Ibenez, owned by Gibson, they sell guitars shaped and look the same as their Gibson counterparts, but lack the tonal quality of the wood. 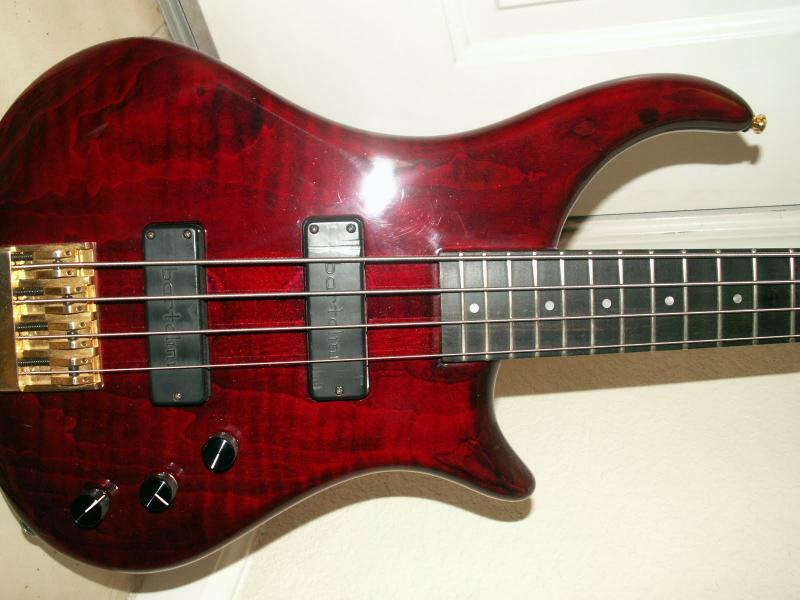 Generally Electric Bass players have no choice but to start on a solid body instrument. They also make acoustic body electric basses, but they are generally much more expensive. Mike Pedualla makes boutique high end Solid Body Instruments. They are played by many of the world's greatest bass players. He made the bass that is pictured, an incredibly lively, responsive, hi fi punchy bass. “Basses are first made acoustically, and that’s where the heart of a good bass comes from—that’s where it sounds off first,” he asserts. As a result, he gives primacy to body shape and wood choice, treating electronics as a component that is “there to bring out what the bass already is.” If you put your ear to the horn of one of his basses, he argues, that’s the same sound you’ll hear coming out of the amplifier." The first thing I do when selecting a solid body instrument is play it unplugged. If it doesn't sing when it's not plugged I don't even bother with plugging it in. Watch out for absurdly heavy instruments as they may have more sustain but are a pain to own and play. Realize you may have over 25 lbs hanging on your back for hours. For example, my Pedulla Thunderbass is rather lightweight and a pleasure to play It is very lively, responsive and versatile. While I highly recommend beginners start with acoustic instruments, I am happy to teach students on solid body instruments. For an electric bass it's really your only choice. Electric Guitars are more expensive because you are paying for the instrument, the electronics and an amp. Many students start on acoustic instruments, continue on acoustics but then also want to play an electric instrument which is a natural evolution. When the student needs an electric, they will be able to play them and select one that feels right to them. Wash your hands before playing, and clean the strings off after playing them. You hands have natural oils and acids which effect the string life. No one ever regretted getting a better instrument. It will generally sound much better, be easier to play, and will actually improve it's sound over time and be more motivating. A higher end used instrument generally are your best investment. Not only will you get a much better instrument for your money, they will likely appreciate in value. Cosmetics flaws drastically reduce the cost of most instruments. I look for these. In Vintage Instruments, if there are any changes, it vastly reduces their value, even if they improve the instrument. EBAY is a huge gamble. Feedback is fairly useless as many people have friends pad their feedback. Also, people are afraid of leaving honest negative feedback because of the fear of retaliatory feedback. If you buy on EBAY make sure you can return the instrument once your teacher or expert can inspect it. That said, in today's economy there are many great deals on EBAY. In bad economic times many great values are sadly posted on EBAY. If you bid, bid in the last minute to get out of bidding wars. ESNIPE.COM automatically will enter your bid in the last 6 seconds of the auction. People are like sheep, if no one bids, it is unlikely anyone will bid. If someone puts in an early bid, then bids start coming in. If you want an instrument do not bid early on. Contact the seller to verify the condition and see why they are selling it. Then only bid in the last minute using ESNIPE. If your bid isn't high enough, there will always be another. First, you have to know what you are buying. Best to have a friend who's an expert go with you. The label can often be fake. There are a million violins labeled Stradivarious, and I can assure you, you have not found an instrument made by the great master. You can find any instrument or electronics on Craigslist. In our economy there are often many instruments and amps available. With our economy there are many great deals and motivated sellers. Be careful of scams, people want cash so be careful. If it sounds too good to be true it is. Scammers often want to buy the instrument sight unseen, sending extra money to pay the person that is their agent. Watch out! If you are selling an instrument (or anything of value) on Craigslist, Criminals will contact you. Criminals make their living scamming people off Craigslist, but there many great deals. Buyers will generally want to buy your item without seeing it, often saying they are helping a friend. They promise payment in what are fraudulant payments, such as fake certified checks or Pay Pal payments. Simply write them saying you accept only cash, and that will stop a criminal in their tracks while not driving away an honest buyer. Consider meeting at a neutral place than letting them case your home. Buyers too good to be true are just that. Pedulla Thunderbass, a hand made, great sounding lightweight modern electric bass.